Nestled at the heart of the Wicklow Mountains, in the vale of Glendalough, is the chance to experience a taste of true Irish heritage. 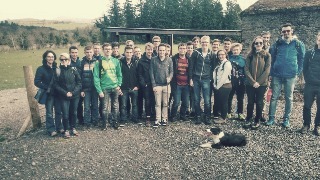 Michael Crowe, a renowned sheepdog handler offers you a memorable experience of seeing working border collies in action. The beautiful views and vibrant scenery of Glendalough create the perfect backdrop and a genuine atmosphere where you will be engrossed in the Irish countryside. You will get the chance to see the Wicklow cheviot sheep being managed by expertly trained sheepdogs. Allow yourself a snapshot of a real Irish experience. Looking for a fun corporate day out? We now offer team building packages, where you and your colleagues can learn what its like to be a sheep herder. Step into the boots of a farmer and work as a team to herd the sheep in various different scenarios. 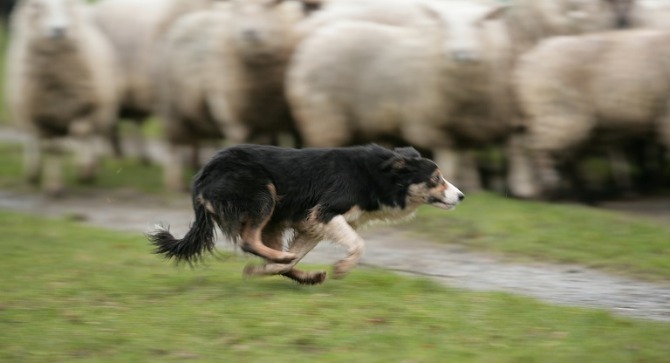 Spend some time away from the hustle and bustle of the office and find your inner sheepdog! Michael and the dogs rounding up the flock. Michael and his dogs are now showing their skills in the quaint setting of God's Cottage in Glendalough, Co. Wicklow, a beautiful area located in a secluded part of the world and surrounded by rolling Irish countryside. Enveloped by a charming and picturesque vale and just a stones skip away, the stunning glacial lake of Glendalough provides the backdrop to our shepherd and his loyal canine companions as they busy themselves telling tales, herding sheep and wowing crowds, young and old alike. Situated along the spectacular Wicklow Way trail, with mountain lakes, forest rivers and streams, fields of wild heather, Irish wildlife and a mountainous skyline; our sheepdog demonstrations are another captivating sight on your fun day out in the heart of Wicklow, Ireland's "Garden County". Spike closing in on the sheep. There’s nothing a sheepdog likes more than to hunt sheep, and Michael will prove this as he puts his dogs to work. Throughout the demonstration, he will explain what each command means, giving a good insight into the dog training technique. This demonstration is a must see for all. You will witness the intelligence of these sheepdogs as they follow the commands obediently. This is a perfect opportunity for you to capture the true essence of Irish country living. Here at Irish Working Sheepdogs we are open for bookings all year 'round, just click the button below to book your very own sheepdog adventure!